Yamana Gold Jumped 46% in 2016: Can It Jump Even Higher in 2017? Yamana added some glitter to its investors' portfolios in 2016, and there may be more to come in the new year. With prices rising as much as 21% last August, gold looked like it was bouncing back last year from the slide that it has endured since 2013. Donald Trump's election put an end to that, though -- from the election to the end of December, the price of gold fell nearly 11%. In the midst of this volatility, however, shares of Yamana Gold (NYSE:AUY), a global leader among gold stocks, climbed more than 46%. Let's dig into the company's performance in 2016 and see what we can expect in 2017. Reducing its debt by $286 million in fiscal 2015, Yamana acknowledged its interest in further strengthening its balance sheet , identifying a debt-reduction target of $300 million in fiscal years 2016 and 2017. And in one transaction, Yamana took a giant step toward achieving that target. Selling its Mercedes mine in Mexico in September, Yamana received $122.5 million in cash and $22.5 million in shares, warrants, and net smelter return royalties -- all of which the company planned on using to reduce its debt. Divesting its Mercedes mine wasn't the only action the company took in 2016 to streamline its portfolio. In December, Yamana -- holding about 85% of the issued and outstanding shares -- completed the spin-off of Brio Gold into a standalone public company. Like the sale of Mercedes, management intends to use some of the proceeds (about C$56.3 million) from the spin-off to further reduce Yamana's debt. The company could also count 2016 a success from an operations perspective. Although it hasn't released its Q4 earnings yet, management recently reported that preliminary results indicate that the company achieved its production estimates for gold, silver, and copper production. Management also reported that at $914 per gold ounce, preliminary results suggest Yamana achieved its co-product all-in sustaining costs for gold production estimate: between $880 and $920 per gold ounce. Characterized as the next of Yamana's cornerstone mines, Cerro Moro, located in Argentina, is expected to begin gold production in early 2018. Management estimates that over an initial six-year mine life, Cerro Moro will average annual gold production of 130,000 gold ounces and 6.4 million ounces of silver. Progress at Cerro Moro is important, as the company looks to replace gold production that it will be lost as a a result of the divestiture of Mercedes. According to management, approximately $224 million will be spent through 2017 and 2018 to complete the project. Another growth catalyst on Yamana's horizon is Suruca. Located at its Chapada mine in Brazil, Suruca is an example of Yamana's ability to grow organically. The company is in the process of updating the feasibility study, so investors will want to monitor this in the coming year. Gold production at Suruca isn't expected to begin until 2019, but, when it does, management estimates that production will total between 45,000 and 60,000 gold ounces over an initial mine life of four to five years. To put this in context, Chapada, according to management's preliminary results, produced 107,000 ounces of gold in fiscal 2016. We've looked at what's behind Yamana and what's ahead, so let's turn our attention now to its stock. One thing to remember when evaluating mining companies is that assigning a value to an asset, like a mine, is far from cut and dried; consequently, companies may take large writedowns on their assets, resulting in skewed earnings figures. One thing that can't be massaged, though, is cash flow, so foregoing the traditional price-to-earnings ratio, let's consider the stock in terms of its free cash flow on a trailing-12-month basis. Since fiscal 2015 was the first year that Yamana was free cash flow positive since fiscal 2011, it's misleading to look more than one year back at the stock through the price-to-free cash flow metric. 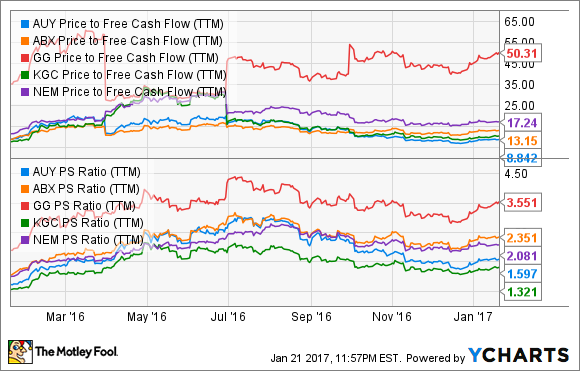 Nonetheless, when we look over the past year, we find that the stock, currently trading at about 8.8 times free cash flow, seems to be inexpensive. It seems insufficient to consider only one valuation metric, so let's also look at it's price-to-sales ratio on a trailing-12-month basis. Trading at about 1.6 times sales, shares look reasonable -- about the midpoint of its high and low for the year. And according to Morningstar, which pegs the stock's price-to-sales ratio at a five-year average of 3.2, the shares seem even more fairly valued. To provide more context for the stock's valuation, let's consider it alongside its peers: Barrick Gold, Goldcorp, Kinross Gold, and Newmont Mining. 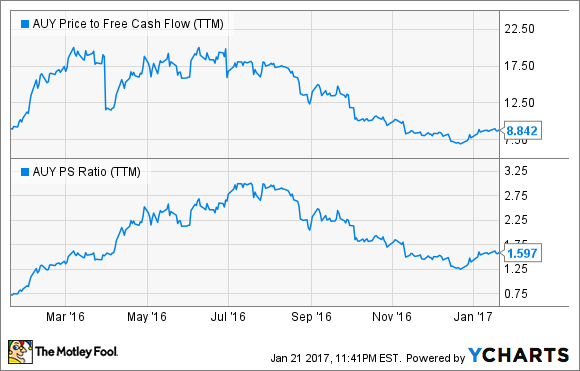 In terms of both free cash flow and sales, Yamana seems like quite a bargain. Overall, considering where shares are trading today, the stock -- though not a screaming buy -- seems attractively priced. Shares of Yamana Gold enjoyed quite the ride in 2016, but there's no guarantee that it will continue flying higher through 2017. Wall Street, not baking any irrational expectations into the stock, seems to be unimpressed with the company which may represent a buying opportunity. In streamlining its portfolio through the divestment of Mercedes, spin-off of Brio Gold, and execution of projects in its pipeline, Yamana Gold represents a reasonable consideration for investors looking to gain exposure to the gold industry.